You interview a “migraine” sufferer who hopes to find the relief that has so far eluded him. During the history taking, he reports experiencing the premonitory aura typical of migraine as well as photophobia and occasionally nausea. One description, though, raises a question about the cause of his headaches: he says the intense pain recurs at roughly the same time of day and lasts for about 45 minutes; he is unable to concentrate on anything but the pain and he paces ceaselessly until it abates. 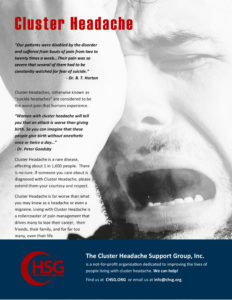 The odds now favor a diagnosis of cluster headache. Vanilloid receptor 1 (TRPV1) is activated by chemical ligands and heat. In this study, we found that each of the group B antagonists competed with and prevented BCTC, AMG6880 or AMG7472 antagonism of rat TRPV1 activation by protons with pA2 values similar to those for blocking capsaicin, indicating that proton activation does not alter the conformation of the TRPV1 capsaicin-binding pocket. In conclusion, group A antagonists seem to lock the channel conformation in the closed state, blocking both capsaicin and proton activation.